Our family has always loved the outdoors. I hardly remember a time when the weather was over 60° that we couldn’t be found sitting on our deck or patio, often entertaining friends and family. About 10 years ago, I happened upon a display of built in grills at a local specialty store. Wow! This was something that had never crossed my mind – an outdoor kitchen. After several weeks of research, I designed a basic L-shaped grill area with a bar. With the help of family and friends, over the course of several weekends, an outdoor entertainment area emerged that was more than I had ever imagined it could be. We used this area from spring to late fall several days a week. Five years later we put a roof over the area, expanded the counter top, added a second grill, refrigerator and a sound system. Now, we found ourselves using this area even when it was raining or snowing. 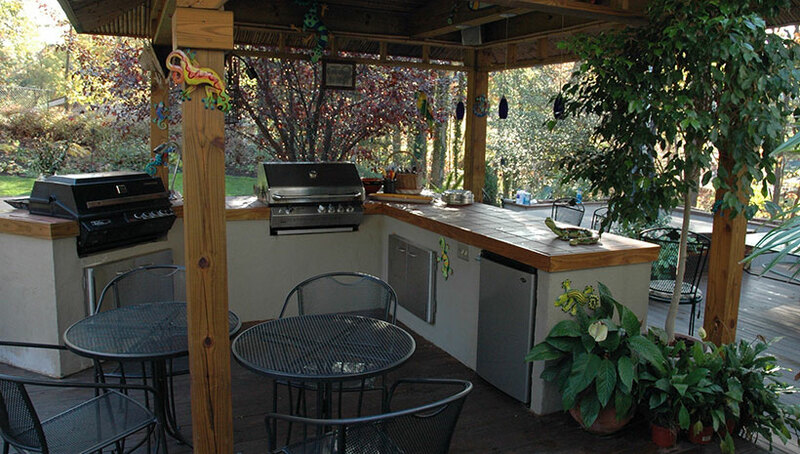 There is no doubt that our outdoor kitchen was the major attraction when we sold our house several years later. There wasn’t a single family that didn’t rave over this area. Our house sold in less than 30 days without a realtor. One of the first home improvements we made to our new home was the addition of an outdoor kitchen by the inground pool. 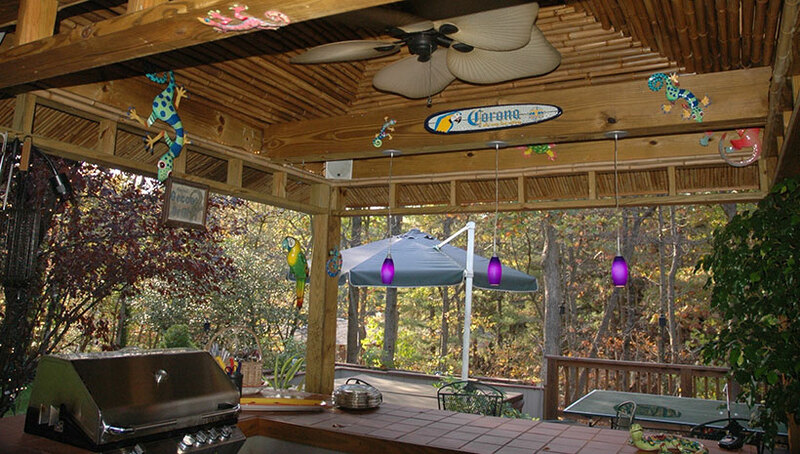 The outdoor kitchen transformed this area from a place the teenagers used during the day, to a family entertainment center that is used most evenings. Research has shown that the addition of an outdoor kitchen is one of the best return on investment home improvement projects a homeowner can do. Outdoor kitchens can offer as much as a 133% return on investment. While the numbers are enticing, I believe that most important aspect of an outdoor kitchen is the creation of an entertainment space that brings people together. As a host, I’ve given up on trying to get people out of the kitchen and into the dining room. We’ve just added a second kitchen, a fun kitchen next to the pool. The kitchen is where we want to be – it is the heart of the home, where memories are shared and made . . . as we break bread together with friends and family. Affordable Outdoor Kitchens (AOK) was formed in the spring of 2011 with one thing in mind, to provide the the very best outdoor appliances and furnishings to contractors at a price that puts outdoor kitchens within the reach of their customer – the homeowner. After listening to the issues and concerns of many business owners, we discovered that contractors did not want the responsibility of providing appliances and furnishings to their customers. Most contractors send their homeowners to the internet to shop for products – without the benefit of an expert who can guide them toward the products that will meet their specific cooking needs and budget. AOK will work with you and your customer to achieve the very best outdoor kitchen designs, select the correct appliances and accessories, and help them furnish their living space – at a price that makes everyone happy. Furthermore, if there is an issue with any product we provide, AOK will service or replace that item. Every item we carry has been fully research, many have been personally tested, to ensure that AOK is only offering the highest quality products on the market. We are excited by the enthusiasm our products have been met with by the business owners we have served this year. We are proud to offer our Outdoor Kitchen product manual and AOK’s design services along with our new 3,000 sq. ft. showroom to help your customers achieve the ultimate outdoor experience.